Hawaii senior Amani Purcell has moved from outside linebacker to left defensive end this season. Mel Purcell Jr. has one son pushing for a job in the NFL and another slated to start for a nationally ranked Hawaii team. But their football exploits aren't what this proud dad relishes most. "Two athletes in the university, two graduates, that's a hundred percent," he said. "They've achieved what Mom and Dad wanted them to do, and that's graduate using sports as a vehicle to get there." The father of former Hawaii defensive end Melila Purcell and current Warrior Amani Purcell arrived here on Monday after watching his elder son play for the Cleveland Browns in a preseason game in Denver. He'll stay through the weekend, when Amani takes the field in UH's season opener against Northern Colorado at Aloha Stadium, before returning home to American Samoa. And not long after the Warriors wrap up the regular season in December, Amani Purcell is anticipating joining his brother as a degree-holder from UH. "It's been a big deal for me," said Amani Purcell, who is 12 credits away from earning his sociology degree. "My parents have been preaching that since we were little -- go to college, get a degree and get a paying job. "When I saw (Melila) graduate I was real proud of him and it made me determined to graduate even more." Along with making sure he passes his remaining classes, Purcell's attention is fixed on helping ease the loss of big brother on the Warrior defensive front in his senior season. An outside linebacker much of last season, Purcell has settled into his new position at left defensive end leading up to tomorrow's opener. Purcell signed with Penn State coming out of Leone High School in American Samoa in 2003 and spent two seasons with the Nittany Lions. Upon transferring to UH to play with his older brother, he sat out the 2005 season and made his Warriors debut last year. A knee injury sidelined him for three games and he finished the year with 11 total tackles, including a sack. "I'm a senior, but I still have to prove I can play, so I'm trying to show more by my actions than my words," he said. "I'm trying to hustle a little bit harder and be more precise." Purcell worked to pack on 30 pounds last year in an effort to play in Jerry Glanville's 3-4 front. With new defensive coordinator Greg McMackin looking for linemen lighter on their feet this season, he's dropped about 15 pounds to check in at 6-foot-4, 272 while maintaining his strength. "When he first came (Purcell's strength) was his quickness," said senior offensive lineman Hercules Satele, one of Purcell's cousins on the team. "Now he's added the weight and he still got the quickness, but he's got some power with that too now." Purcell said having his brother here eased his transition into the UH program, and they talk about twice a week as Melila tries to make the Browns roster. And Amani understands if his father makes more trips to the mainland than Hawaii this fall. "It always feels good to have my dad at the game," Amani said. "But I told him not to worry about me this year, told him to support Mel. It's his rookie year and he needs to see the family as much as he can." Blaze Soares gave it his best shot, but the sophomore strongside linebacker won't be playing tomorrow because of a pulled hamstring. "The best thing is to rest it," said Soares, who'd been projected to make his first career start. "I hate watching, but some things happen for a reason. I've been reading the Bible a lot lately, and that helps my patience. "LaTech is a more important game," he said. Senior Brad Kalilimoku will take his place. It will be Kalilimoku's 24th career start. "He can play either side," defensive coordinator Greg McMackin said of Kalilimoku. "He's got great speed and can hit and he's a real smart ballplayer. He's been playing all along and getting a lot of reps and been in our plans since the spring." Sophomore defensive end John Fonoti is also out after missing practice this week and last with bruised heels. Quarterback Colt Brennan left practice a little early when his foot was stepped on by a teammate. "No worries, you know how when your foot gets stepped on and it hurts at first and it's annoying," Brennan said. "I'm walking fine right now; there's nothing wrong." Senior cornerback Ryan Keomaka returned to practice yesterday (helmet, no pads) and junior corner Calvin Roberts was set to return for today's walk-through. 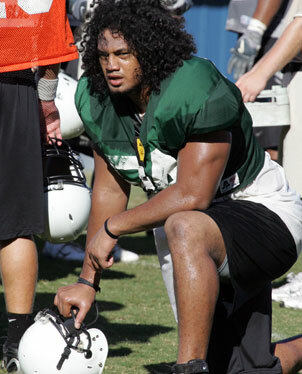 Keomaka -- who was listed as the second-team left corner after spring practice -- did not participate in fall camp and had to meet academic requirements before rejoining the team. Keomaka, also a valuable special teams member, has made 60 tackles and three interceptions in 32 career games. "He won't be suiting up (tomorrow)," said coach June Jones, pointing out that Keomaka has to practice with pads before he can play in a game. "(Keomaka) gives us more depth and competition," McMackin said. "We started out with out a lot of depth at the corner and now a good depth situation." Roberts joined the Warriors during fall camp and was running with the second team. He was taken out of practice Wednesday and did not practice yesterday. He said UH needed written verification of his associate's degree from College of San Mateo (Calif.). "It was posted on the Internet, but they needed the actual paper," Roberts said. "They got it (yesterday)." Roberts said he didn't know last night if he would be among the 75 Warriors suiting up tomorrow. McMackin said he didn't know yet either. Brennan and Soares both had the Hawaiian island chain dyed into their gold hair. Defensive end Victor Clore had a beehive design of alternating brown and gold circles on his dome. Dave Reardon of the Star-Bulletin contributed to this report.